To purchase tickets visit smarttix.com or call 212 868-4444. 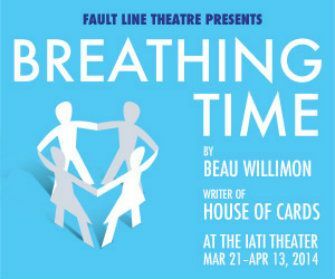 BOTTOM LINE: A new play by House of Cards’ Beau Willimon makes its world premiere in an intimate setting. Jack (Craig Wesley Divino) and Mike (Lee Dolson) are two men who share an office in the financial district in Giuliani-era New York City. The first scene takes place entirely in their office, where we get to know the personalities and backgrounds of these characters. Jack is a bachelor, who we meet as he comes in with a bad hangover from the night before. Mike is a family man, who always gets to work early. Jack has an important marketing presentation to prepare for, and Mike has some advice about how to put his plan into action. In the real-time hour or so before the meeting, the men make small talk, allowing their dynamic to build. The first scene is heavy on the “bro talk”; for example, they spend a lot of time discussing Jack’s attractive assistant. Willimon writes some of the strongest and most realistic dialogue in theater; it’s almost Aaron Sorkin-esque, especially in pace, and the actors, along with director Aaron Rossini, navigate it very well. Dolson and Divino are also very believable as two coworkers who see each other every day; they have an easy chemistry. Overall, Breathing Time has a strong ensemble of actors who are up to the challenge of Willimon’s writing. The set design by Tristan Jeffers makes an excellent use of the black box space and creates a very realistic representation of an office setting. While moments of the play are compelling, notably the story Jack tells about his father’s time in Vietnam, as well as the rapport between the two leading men, the first scene feels rather long. Much of the chatter is banal and overall unnecessary to the point of the story, and then abruptly switches to a scene with the family members of the men. Shannon Marie Sullivan plays Jack’s sister Denise, and Molly Thomas plays Mike’s wife Julie. The two do a nice job creating a tense scene in a restaurant as they meet for dinner. Both Sullivan and Thomas manage to turn in memorable performances with significantly less stage time than the two leads. I can’t explain the specifics of the plot without spoiling the story; it is a play that you should just take in and watch unravel. Part of the pleasure of this play, for me, is that the audience is not sure where it is going. The show runs a tight 90 minutes, and while it isn’t Beau Willimon’s best work, I think it’s a fair assessment to say that he is one of our strongest modern playwrights.